Everbrew is an Ohio Department of Agriculture certified specialty fertilizer; also referred to as a soil additive (nutrient supplement). Everbrew is meant for any type of garden whether it is used for urban agriculture, farming, or simply plant beds in your yard. Everbrew is made from all natural ingredients which are locally sourced in Cleveland, Ohio. Everarbor's Everbrew is a tested and analyzed mixture of coffee shop waste mixed with brewery waste; producing a soil additive with higher nutrient content (Total Nitrogen 3.43%) than some leading brands. It is packaged in 5 gallon buckets and 2 gallon which are measured by the volume, not the weight. We also offer 4lb. burlab bags of Everbrew. 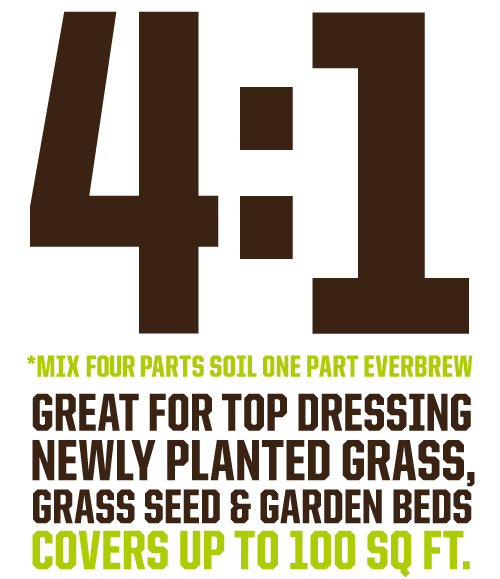 To achieve optimal results, either mix Everbrew with existing/potting soil or use as a grass topdressing. When mixing with soil, mix at a 4:1 ratio. That is, 4 parts soil and 1 part Everbrew. The intended use of the product is a soil supplement (also referred to as an amendment) or potting media. It is meant to be mixed with the soil used for planting (ex. existing soil or potting soil). It is also intended for use as a grass or turf topdressing. Everbrew can be used in place of chemical fertilizers on grass seed, new/established grass, as well as in plant beds. 1 Lg. BUCKET COVERS/SPREADS UP TO 75 SQ. FT.
1 Sm. BUCKET COVERS/SPREADS UP TO 50 SQ. FT.
1 4lb. BURLAP BAG COVERS/SPREADS UP TO 35 SQ. FT.
See the "Purchase Everbrew" page for details on how to purchase online and have it shipped to you.